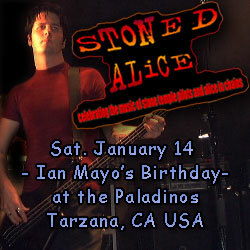 January 14th is Ian Mayo’s birthday. on the same day, He will be doing a gig with Stoned Alice at the Paladinos Tarzana, CA USA. come out to celeblate his b-day! Happy Birthday Ian….Hope life is treating you great with many blessings! Happy birthday Ian! Hope you have a great day filled with all you wish for and have a fantastic gig with Stoned Alice! You guys were AWESOME last night! GREAT show!